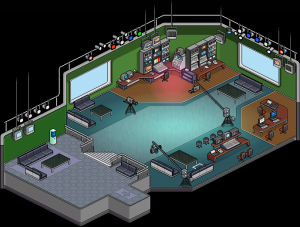 The Habbo TV Studio is a room which is designed to look like a TV set - including cameras and lighting. As this furni was unavailable elsewhere in the hotel, this room attracted many roleplaying groups. It was used often for promotional events, especially those concerning TV programs. There was a billboard added soon after its initial release, which changed for each campaign. This page was last edited on 20 June 2018, at 15:58.